I'm a volunteer coordinator for the Nature Valley Grand Prix/Great River Energy Bicycle Festival which is coming up next week and we're still looking for more volunteers. I thought I'd post the info and see if anyone bites. 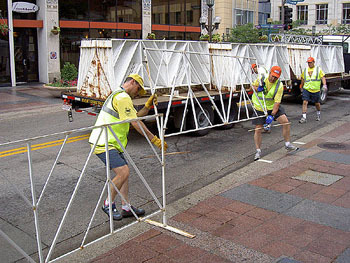 For each race, there is setup work to be done, course marshalling during the race itself, and then teardown afterwards. There are volunteer shifts for all of these work needs at each event and I'd like to ask you to consider signing up to work a shift or two. One of the women zooms past. The course marshalls are very close to the action. 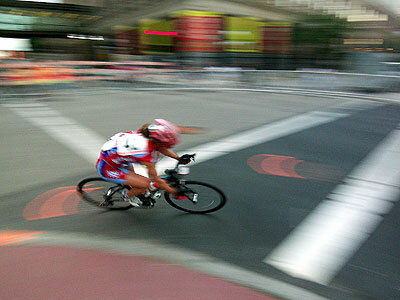 Don't care much about bicycle racing? Yeah, me either. However, there is fun to be had working on events like this with friends and, in the end, the profits from the races go to Children's Hospital and Clinics of Minnesota. I've volunteered for several years but last December, now part of the organizing committee, was at the meeting where we presented one of those big printed checks to a doctor at the Clinics, who went on to discuss the palliative care for terminally ill children he works on. There were suppressed sniffles throughout the room. I hadn't worked these races for noble purposes, but felt privileged to be there for this presentation and an aspect of the races I hadn't considered. The setup work is important stuff and goes on even in the rain. We've torn down in roaring thunderstorms before. This is 2007 in Minneapolis. Like to see what to expect as a volunteer? You can read about my experience last year, in 2006 (you have to scroll down) and even in 2005 (you have to scroll down here too). Interested? You can sign up on the NVGP's website volunteer pages. If you don't want to work out on the races but wouldn't mind hosting a bike racer or two for a few nights, we have a Host Housing signup too, though it might be getting late for that. Thanks for reading this, and I hope to see you at a race or two as a volunteer or spectator! "Karla reminded me of something I'd said when she asked me about why Paul would do this, why would he ride up here to work like a dog for several days? She said I responded "Oh, Paul's always up for a bad time". On the face of it, working nights like Friday moving fencing in an unbelievable downpour doesn't sound like a great time, but it's a bonding experience. I wouldn't even say male bonding, because there were several women out there in the rain working away as well. And as they say, of those to whom much is given, much is expected. We are blessed with decades of fun on bicycles, good health, the flexibility to get the time off and the attitude that hard work shared with old friends can be enjoyable. It's also a great time of year to be outside doing stuff. You should consider joining in next year."